The Shure SM58 is an industry-standard which is a highly versatile cardioid dynamic vocal microphone used to a deliver warm and clear vocal reproduction. It is the consistently the first choice for vocal performances around the globe. Ideal for professional vocal artist in any live performance setting. It is tuned to accentuate the warmth and clarity of lead and backing vocals. The SM58 is tailored to target the main sound source while minimising background noise but also with djs / presenters in clubs and in small and large live venues. 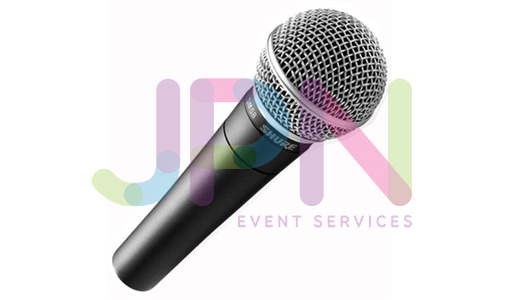 JPN Event Services operate in the Essex, London, Hertfordshire region and some of the towns and villages include Loughton, Chigwell, Buckhurst Hill, Woodford, High Beech, Theydon Bois, Upshire, Abridge, Waltham Abbey, Epping, Ongar, North Weald, Enfield, Thornwood, Lambourne, Broxboume, Hoddesdon, Harlow, Brentwood, Bishop’s Storford, Romford and Chelmsford.